Premium Design - 5-Ports usb car charger features one type c charge port(5v/3.1A) ,one QC 3.0 port (24W Max) and 3 smart usb ports (2.4A Max).One of the most compact 5-port USB car chargers on the market. Incredibly Powerful - Qualcomm Quick Charge 3.0 charge up to 4X faster than standard chargers.Multi-Port charging support at least 5 devices simultaneously at full speed, share with your family or friends conveniently. Advanced Safe Circuitry - Premium intelligent circuitry chips ensure the best charging performance, also can be used at home to convert 220v to 12v to charge your devices. Double protection on the usb port to provide over-heating, over-current and short-circuit protections.High stability and reliability. Wide Compatibility - 12V input compatible with most vehicles,QC3.0 Type c car charger fits for iPhone X 8 8 Plus 7 7 Plus 6 6S plus 5S, iPad pro/mini, GPS,Samsung Galaxy Note 8 S8 plus S8 S7 S7 edge S6 S5, LG G Flex2 LG V10, Google Pixel XL Nexus 4 5 5X 6P, HTC,etc. 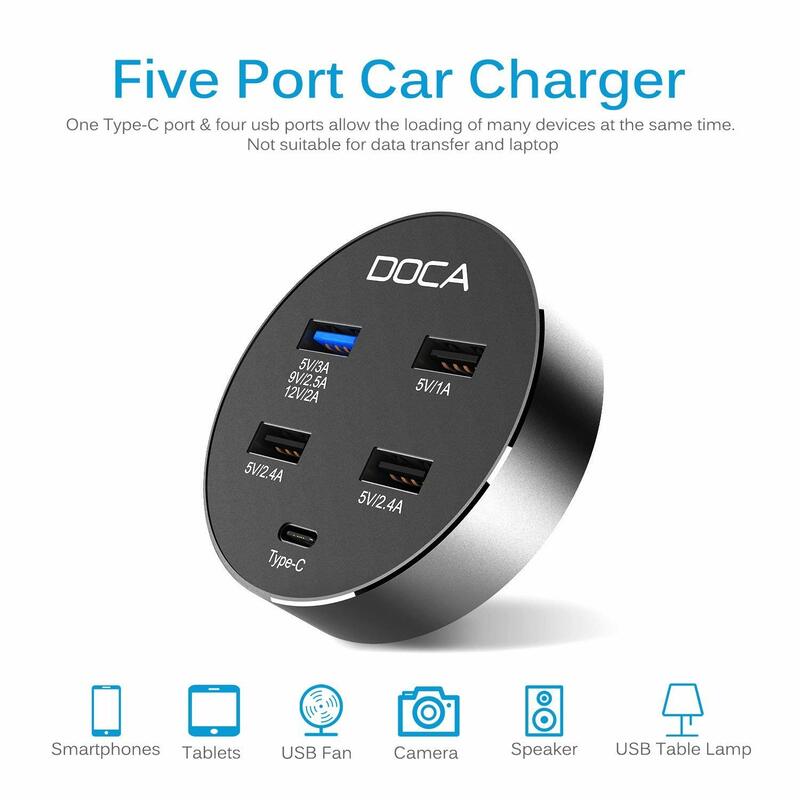 Sleek Design - The usb car charger is designed with hard-wearing matte finish, high-gloss accents and a blue led power indicator for the QC3.0 port which is convenient to use at night.